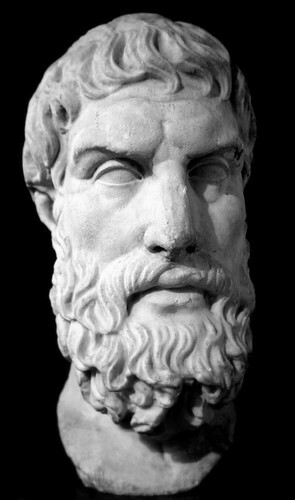 Epicurus was an ancient Greek philosopher. He is often cited as a precursor of modern Humanism, but very little of his teachings have survived except in the recollections of his later followers, in particular in De Rerum Natura by the Roman poet Lucretius. I was not; I have been; I am not; I do not mind. Epicurus acquired a garden in Athens, where he lived in a community of friends, practising a way of life based on the teachings of Democritus. Unusually for his time, he welcomed slaves and women into his group, which lived as a family of equals. Their outlook was that human life had come about by natural processes and that people should therefore live according to nature; this would be easy if people were content with what was enough. They did not think that the world was designed by a supernatural power or had a purpose imposed on it by a deity. Although his views have been criticised, often by religious believers, for their emphasis on happiness as the purpose of life, or “hedonism”, Epicurus and his followers were not self- indulgent or selfish. They promoted detachment and serenity, suggesting that a simple and temperate life would avoid pain, and realised that true happiness depended on moderation and the respect and friendship of others. These views are widely shared by modern humanists. The British Museum contains a bust of Epicurus.